The 9225 Lil’ Devil II™ is the greatly-improved new version of our popular Lil’ Devil™ tank monitor (long a popular industry leader in low-cost tank monitoring). It measures many different fluids, and is especially popular as a water or oil tank monitor. With our original cellular communications remote-monitoring and alerting features, this new system adds a digital display on the unit, and serves more tanks, plus other improvements. for up to 5 tanks, via cellular telecommunications. ● Live data on the digital display panel for local readings. ● Alerts (set to your specification) when a fluid level gets too low or too high — for better product management. ● Alert e-mails sent to you when fluids need to be filled or emptied. Ideal for many fluids where instrument-clogging is a common problem. 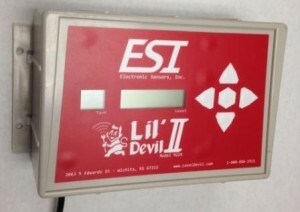 Especially popular as a water or oil tank monitor, Lil’Devil II actually measures many different fluids in vented tanks. When prompted, the monitoring unit pumps air through a tube to the tank, and measures the pressure required to force air bubbles out through the open end of the tube, at the bottom of the tank. The amount of air pressure needed to pump the bubbles varies with the weight (and volume) of the fluid. The pressure information is used to automatically calculate the vertical height (depth) of the fluid in the tank. Then, using the tank size and geometry information stored in the system’s database, Level Devil software calculates the actual gallons remaining in the tank and provides a digital read of the level — either on the tank monitor local display, or in a secure, password-protected online web page. Fluids: Oil, Antifreeze, Paper pulp mix, Water, Wastewater & many other fluids. Accuracy: Better than 1% of span. Mounting location: Indoors, out of weather / dry environment.